Pandora is an only child. With an absent mother and no existent father, she finds herself alone, yet again, on that of her seventeenth birthday. But when her estranged father makes contact for the first time in ten years, curiosity gets the better of Pandora, who ignores her mother's warning to stay away from the man that walked out of both their lives. He sends Pandora to a blog that he's created, with twelve photos of her and her father together in different locations, each accompanied by a letter. Time restraints barely allow Pandora to print each photo, and that is where the game begins. Pandora's Box is the latest online game, where millions all around the world live within their online fantasy world. But when Pandora connects to her user account, she finds a strange personalised message, just before the phone towers are knocked out. With no television, no internet and no way of contacting anyone, Pandora finds herself at the new neighbours house. But it isn't only her house that's effected. Eli and Theo are stepbrothers, home alone when their newly married parents are away on their honeymoon. Like day and night, Eli is blonde, flirtatious and charming, while Theo is dark and brooding. Their house is now offline as well, after Eli tried to connect to the popular game. Theo is somewhat of a technology expert, and between the three, they realise that Pandora's Box has unleashed a virus that seems to be affecting all online services, when the lights go out. The aim of the sick online game, is to save the world virtually before society crumbles around them. The hacker has control of the game, the utility companies and power plants, threatening to wipe out humanity unless Pandora beats the game. The countdown is set for ten days, and time is already running out. This isn't a cruel prank, the streets have turned violent with riots and it's every man, or teenage girl for themselves. Luckily Pandora has Eli and Theo along for the ride, the boys strangely prepared when homeland security are hot on Pandora's trail. She's now wanted for cyber terrorism, and armed with her laptop and boy genius Theo, she's forced to play on the run. The clue to survival lies within the twelve photos, each location within the game revealing a new clue to the location in which Pandora needs to travel. But as the lines between reality and real life blur, will Pandora beat the game and save the world? Doomed is explosive! I was immersed and completely enthralled from cover to cover, forcing me to read into the early hours of the morning just to find out what happened next. Rarely does a book infatuate me completely, but Doomed did exactly that. Pandora's Box is a hugely popular online game, that seemingly has unleashed a killer virus on the world. Everything that is controlled by an online system, utilities, broadcasts, nuclear power plants, all at the mercy of the hacker. It's a sick game of cat and mouse, Pandora is forced to play the game against her will and only has ten days until annihilation, according to the game master. It's action packed and exhilarating, a rarity in young adult today. Step brothers Theo and Eli are new in town, they all attend the same high school, with Pandora having issues with Theo previously. But when Pandora knocks on their door, they have no qualms about playing the game alongside her, protecting her with their lives. It's a strained relationship at times, with both boys seemingly interested in her. Although Pandora is effected by the extra attention, her main focus is the game. But it isn't the characters that are the main draw card in Doomed, it's the storyline. Tracy Deebs has woven an incredible storyline that mixes cyber terrorism, a warped environmental message and the world on verge of an apocalyptic meltdown. I loved it. I more than loved it, I inhaled it. It was everything I want in a book, explosive, tense, action packed and absolutely phenomenal. Tracy Deebs, you are incredible! Okay I totally freaked out reading the blurb when it said "there’s no Internet." WHAT KIND OF A WORLD IS THAT?!!! *hyperventilates quietly in the corner* It's just a book. It's just a book. I probably will need to read this because a) awesome cover, b) awesome sounding plot...but TERRIBLE HORRIBLE premise if it involves no Internet. I know, I KNOW! That alone was frightening enough, but then the author turns an online PC game into an apocalyptic World of Warcraft. It was totally bizarre but incredibly brilliant. And no internet is the least of their problems. This book sounds amazing! It wasn't high on my radar before, but it definitely is now. Sounds like an exciting thrillride of a book. I think she's still rocking herself. I think with it's unassuming cover and the vague description, quite a few readers might pass this one by. I love a great young adult science fiction, and this one was incredible. Being a gaming nerd, I'm almost certain you'll love this one Jeann. It's really more of an anti love triangle. There's plenty of intensity between the three, but Pandora isn't one of those swooning heroines that loses her head. There's not much on the romance side until towards the very end, so thankfully it didn't take away from the storyline. I absolutely loved this one. I put this aside when I got it because I hadn't heard anything about it but the fact that you could not put it down definitely makes me want to read it and soon! You won't be disappointed. 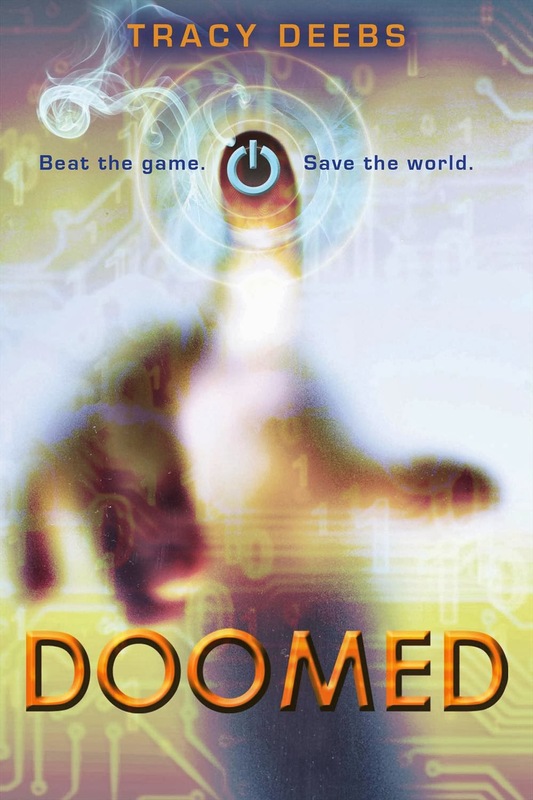 My only complaint was when the characters were involved in the online game, the edges of their reality seemed to blur a little, but it's just awesome, I hope more young adult readers get on board with Doomed. Awesome review! This book was a surprising read for me. Like yourself, I devoured it--I hadn't even heard of it before I received my review copy. Hey Rachel, lovely to see you again. I had this one on my shelf for a while, when a copy arrived I couldn't wait to begin. It was even better that I'd expected. I'm a post apocalyptic and dystopian junkie, so this was the perfect read for me. It was brilliant. I'm hoping we'll see a follow up.